Would you, or someone you know, be interested in working for our Department of Public Works (DPW) on one of the new Street Maintenance Teams? There are 36 new jobs available and DPW is having a Job Fair on Monday, August 27th, from 8 a.m. – 1:30 p.m. at 1725 S. West Street. The attached flyer gives much more information about these jobs, how to apply, and how to get more information. Attendees will be able to apply on the spot. Once trained, and with new equipment that the City has purchased, these crews will be able to do a lot more work on our City’s infrastructure “in house”. This will be a huge help to many of our streets and sidewalks. 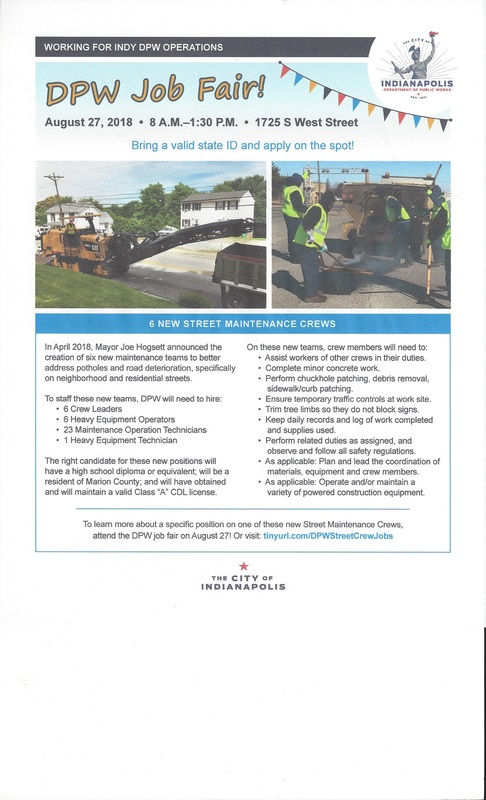 I am really looking forward to this happening, and would certainly like to see some individuals from our district who are dedicated to helping our City and have a great work ethic be part of these new crews. PLEASE feel free to pass this information on to others – folks in your neighborhood, your friends and relatives, your church, or any other group to help get the word out about this Job Fair and help DPW to get the best people to fill these positions.